Notice anything odd about it? Yeah, it’s not the most innovative layout or color scheme. But what really jumps out at me is how weird it looks having that real estate agent floating in a white rectangle on an otherwise blue background. So I couldn’t resist; I decided to fire up PowerPoint and give this slide a little visual design makeover. Now let’s compare my original version, above, to the one I created today, below. That’s better, right? All it took was a little creativity and some PowerPoint magic! What exactly did I do and how did I do it? For starters, I removed the white background on the real estate agent’s image to blend her into the overall composition of my slide. In the new version, she’s grounded (not floating), and she gives the slide some depth and dimension against the blurred background. She also looks purposeful, not just decorative. 2. Insert the image you want to edit by clicking the Insert tab, selecting Pictures, and then browsing to the location of the saved image on your computer. Click to select the image, and then click on the Insert button to drop it onto your slide. 3. Click on the newly inserted image to select it. You should see a Picture Tools, Format tab appear on your ribbon. 4. Under Picture Tools, on the Format tab, click Remove Background. 5. Once you’ve completed Step 4, you’ll notice that the background of your image will change to a pink color and the foreground area will look the same. The hot pink provides some contrast, making it easier for you to see the parts of the image that PowerPoint perceives as being the background. The Remove Background feature is pretty smart. In many cases you’ll end up with the result you wanted without any additional work; in other cases, you’ll need to do some more fine-tuning (see Step 6). For those times when you need to do a little more fine-tuning, that high-contrast pink will be helpful for selecting the precise areas of your image that you want to keep and remove. If PowerPoint removed areas you wanted to keep, click Mark Areas to Keep and use the drawing pencil to mark the areas on the picture that you want to keep. Simply click and drag your mouse to draw a green line over the area of your image that you want to keep. When you release your mouse button, PowerPoint will remove the pink color from the specified areas you want to keep. If PowerPoint didn’t remove enough of the background, click Mark Areas to Remove and use the drawing pencil to mark those areas by clicking and dragging a green line over the area you want to remove. When you release your mouse button, PowerPoint will add the pink color to the areas you identified for removal. 7. When you’re satisfied with how your image looks, click Keep Changes to save these changes to your image. Or, if you don’t like how it looks, just click Discard All Changes in the Close group to reset the image and start again. Following is a little animated gif I made to show you how steps 5-7 look in action. Check it out! Pro tips: The Remove Background feature works best on images with a lot of contrast between the foreground colors and background colors (e.g., a dark subject on a white or light-colored background). Keep in mind that any changes you make to images in PowerPoint only affect the copy of the image you inserted; they won’t change the original image file. I find it’s best to right-click on the newly edited image and select Save As Picture and then rename it to save it as a new file. Also, you can’t use the Remove Background feature on Adobe Illustrator Graphics (AI), Windows Metafile Format (WMF), and Vector Drawing File (DRW). But you can remove the background from Scalable Vector Graphic (SVG) files. 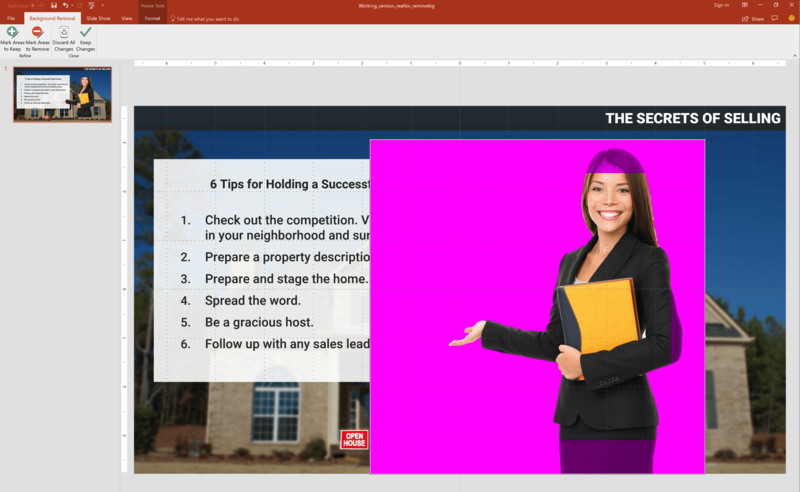 Check out Tom Kuhlmann's step-by-step walk-through of how that's done in PowerPoint. Create your own illustrations in PowerPoint (even if you can’t draw) with this easy-to-follow how-to from Allison LaMotte. What do you want to learn about PowerPoint? Share your questions with us in a comment and we’ll consider tackling them in a future article. Trina, This is a great tutorial and I have used this technique for several years now. In a lot of the images I do, the final image has a white line on the edge of the image. Is there a way to avoid that or to get rid of it? Also, I find that even right-click and save as picture sometimes still leaves a white background around the image. You might want to mention using Format, ReColor, Set Transparent Color so the image can be placed on any background. Hi Jeffrey. Thanks for your feedback. And yes, that white edge you're referring to is often something that can't be helped. For instance, I find when the subject has dark, straight hair, the lighting used for the photograph will reflect off the subject's hair or the light background will reflect off the subject's hair creating a kind of halo effect. Sometimes you can make that work if your subject and your background are lit from the same angle, but generally I find you need to get a little creative. A few things I've done that have helped include washing out the background so the white edge blends in a bit more and is less stark, and blurring the edges of my subject by 1 pixel to blow out edge just a little. In the end, characters with no background (transparent .pngs) are ideal, which is why I tend to rely on Content Library characters in Articulate Storyline 360 or Studio 360 in most of my projects. They're just a great time-saver! But it's nice to know there are some easy-to-use tools for removing the background from a subject when the need arises. Photoshop is really the only way to get rid of the white or contaminated edges around a cutout. Hair is usually the main issue especially wispy fine strands. Though this is fine on a white background. Great feature though. And If you don't have access to PhotoShop, Jeffrey I find GIMP (https://www.gimp.org/) also works really well for this purpose and there are loads of free tuts on YouTube for removing image backgrounds. Hi! Great tutorial. I recently found out you can use the same technique in the new Paint 3D to cut out images. Super easy as well. Thanks, Wiebe! I'll have to try Paint 3D. I'm not familiar with that tool, but sounds like it would be easy to pick-up if it uses the same basic technique. It is a really helpful tutorial! I've played with a couple of images right now and it seems that the more you let the computer do his own math, the better is the result. When you do a lot of touchups with "Mark Areas to Keep" or "Mark Areas to Remove", then it also shows more of the white border in the final work. I chose some of Bing stock photos with high contrast background and the original result was pretty nice! Leva, I totally agree. The Remove Background tool is pretty smart and playing with it sometimes yields better results and sometimes not. I think it just depends on the color of the background behind your subject. Glad you found this tutorial helpful! Very helpful tutorial, thank you :-) Another way of achieving the same result with the image given is to use the "set transparent colour" function. This works well if there is one colour you can pick up to ignore (like the white background behind the estate agent). You can find this option by selecting an image and then go to Color - Set Transparent Color. Wow, thank you for this Trina. I never knew there were such powerful graphic tools in PowerPoint! You're welcome, Sumant. Glad this article was so helpful! How did I not know this? What a great time saver, thanks for the tutorial, very clear and precise! The key to good background removal is high contrast. Dark outfits on light backgrounds and vice versa. You run into problems when it's difficult for PowerPoint to distinguish between brown shoes and brown stone the shoe is stepping on. Also, without strong contrast, it's not always easy for PowerPoint to distinguish where the border is between background and foreground image. Here's a neat site I found for background removal too: https://www.remove.bg/ The results are not too bad, compared to powerpoint etc., and pretty easy/fast too. Anyone else used it? Wow Maxwell thanks for the tip. I just tried this and it worked very will without the white line around the image. It was also quick! Amazing this is free but yes spread the word. I have not heard of this before. It turns out this only works on photos with people. That makes it limited but still effective for those times you want an image of a person. Thanks for sharing. Glad to share, Jeffrey. Really cool tool.